A Spousal RRSP is a registered account thats purpose is to shift income from an earner in a high tax bracket to a spouse in a lower tax bracket. In situations where one person makes the majority of the family income, without a spousal RRSP that person would have to keep all retirement savings in their own name. Then, upon retirement would have to withdrawal and pay tax on the money themselves. What the spousal account does is allow the high earner to make contributions to their spouses RRSP account. The high earner still gets the immediate tax deduction, but now the money is in the other partners name. The benefit to this arrangement is it provides income splitting. Income splitting is essentially shifting income from one person to another and is it done so when retirement comes both partners can withdrawal money and pay less tax than if one person had made a withdrawal for the same amount. John and Mary are married. John has a lucrative career and his income puts him in the 45% tax bracket. Mary's is a stay at home mom with limited income. Let's jump ahead a number of years. John is now near retirement and over the years has been making regular spousal RRSP contributions into Mary's account. 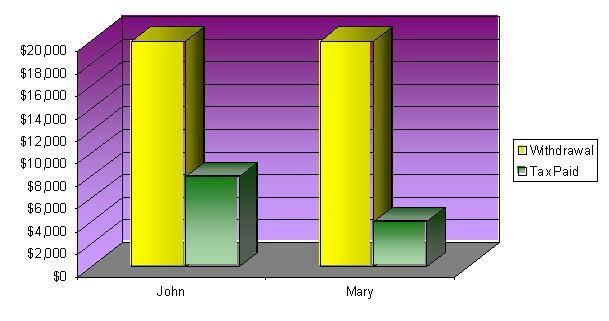 Now the majority of the couples total RRSP savings are in Mary's name. Assume John has pension income in retirement and when he draws on his RSP savings he would be in a 40% tax bracket, Mary 20% as this would be her only income. The couple want to draw $20,000 in total from their RSP savings each year. $20,000 X 20% = $4,000 tax. If John had kept all the money himself over the years his total tax bill would be $20,000 X 40% = $8,000. From this example it is pretty easy to see the benefits of income splitting. Another benefit of this income splitting arrangement is it reduces or even eliminates OAS claw back. In 2009, any OAS eligible person has $0.15 clawed back for income over $66,335. By splitting income pensioners can reduce both tax and OAS claw back. Other benefit of spousal RSP's and income splitting is that is can reduce or eliminate the OAS claw back and pension credit claw back. Now, don't think you can make a spousal RRSP contribution one day and have you spouse take it out the next and have it taxed in his or her hands. These accounts are subject to what is known as the three year rule, which states that spousal contributions must stay in the spousal account for two full years and any part of the third to be taxed in the spouses hands. If withdrawn before that time up, the contributing spouse has to claim the withdrawal as taxable income. This is an example of income attribution, which is covered more in other sections of this site.